Thanks for all your lovely comments on the pink dress - I haven't put it away in the wardrobe yet, instead leaving it to hang on my bedroom door so I can admire it's colourfulness! Gail, you're right that it's not nursing friendly, and nor do I really have any occasion to wear it at the moment since I'm not back at work until next March so it's really an aspirational dress rather than one I can wear right now. Nothing wrong with sewing a pretty dress for no real reason is there? And MareeAllison, you crack me up liking the muslin best - you don't happen to want the rest of that fabric do you? So has everyone realised that Christmas is just around the corner? I haven't even started Christmas shopping and I'm already feeling shopping fatigued - there are just so many birthdays in my circle of family and friends in October, November and December that it's challenging enough to get through them all before starting again on Christmas presents. 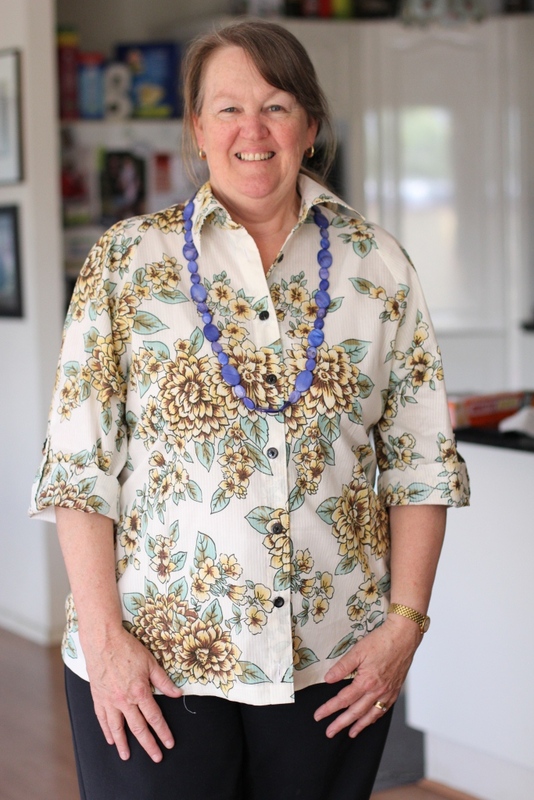 For my mum's birthday a few weeks ago I bought her a vibrant blue linen blazer and matching necklace from Sussan's to brighten up her wardrobe since I'm on a colour crusade for myself and am dragging everyone else along too. I didn't want the blazer to be an orphan in her wardrobe though, so I decided to make her a shirt to go with it too. Annoyingly I didn't pay enough attention when cutting this out to avoid the dreaded 'bullseye' effect of the flowers on the front, but I'm hoping that those flowers on the centre front at bust level are off centre enough and clustered enough not to cause it. Don't worry I trimmed that wayward thread on the hem after taking this photo! And with the leftover fabric I made myself one of those nifty infinity scarves, so none of this fabric made it back into the stash or scraps pile. Bonus! I'm not going to bore you with a tutorial for the infinity scarf - there are already billions of them out there and it's just a strip of fabric sewn into a tube. In fact it's one of my pet hates arising from all the crafty blogs I read - people who do a detailed tutorial for every thing they make, whether it's super simple and not necessary (ooh face washers made from a towel: cut towel into squares), or they've been sewing for about 3 milliseconds and what they made might be exciting to them but is really ordinary/borderline crap, or if there are already millions of tutorials for that out there already. Ooh sorry for veering off into crankyville there, Toby is cutting some teeth and I'm a little sleep deprived these days! That blouse is so lovely! I would have had a hard time giving it away. You mum looks great in it, though, so well done! You're a nice daughter! It looks really lovely - I love those fabrics with the stripes woven in. You crack me up with the tutorial comments... that's why I don't do any ..
That top looks great on your Mum. I am loving colour too. And Sussan really are doing colour so well. OMG Christmas is a nightmare for me...so hard to find the right present...I feel overwhelmed too! The blouse is lovely on your mum Kristie. I never think about using a woven for an infinity scarf. Your mum looks great! My blog pet peeve (that I've done myself now) is eeking out multiple posts for a one post project. LOL. The other thing that I think I've done this year are one too many in progress posts. If and when I do them, it's to have notes for myself. What a lovely daughter you are. You Mum looks great in her new blouse. I hear you on the gazillion tutes demonstrating the exact same basic things. I do like finding different ways to do collars, waistbands, bound buttonholes. Everyone that I have seen has been slightly different and I can chose one that suits me. Love the blouse for your mum, very pretty fabric! Your mum looks really pleased with her new blouse. The print placement looks flattering to me and the print colours look great on her. I also bought my mum a RTW jacket in the winter and ended up taking it back and making her two that fit her much nicely. I hope you get more sleep - one day. The tutes on tailoring techniques are the ones I love to read about. As Marie said, I enjoy seeing new techniques and then I can test them out. However I scan simple things with lots of tutes. The shirt looks lovely on your Mum. And so true about the tutorials - ha. I like the blog header too! Is that new? Your mum's blouse is lovely. I really need to make some infinity scarves; it really is the perfect way to use those pieces that are too big to toss and too small to make a garment. Your mum looks lovely in that blouse. 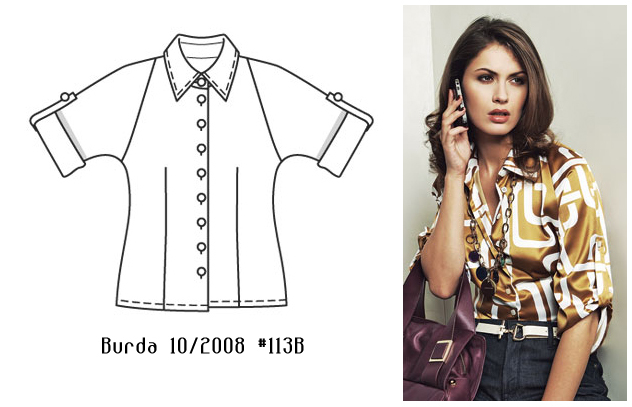 I made the exact same blouse (in white cotton) a couple of years ago and loved it. Unfortunately it doesn't fit me anymore. Did you really sew this blouse in 2 hours? Wow!! 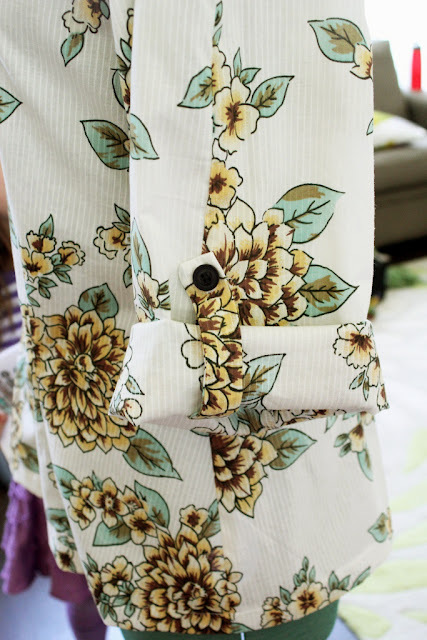 That is one gorgeous shirt - great fabric for it too! Nice blouse! I've been mulling over what to make with some green striped cotton I have, and this pattern will be perfect. I have to slightly disagree with you about tutorials. First, we don't all read the same blogs, so a tutorial you have seen a load of times on lots of different blogs might only pop up in my reader once because I only subscribe to one blog that has that particularly tutorial posted. Second, we all call things by different names - for example I had never heard this type of scarf called an infinity scarf until I just read your post. I was going to write a tutorial myself for making this type of scarf because when I first started my blog just under a year ago I got the most hits from searches that contained the words "faux", "fur" and "scarf". I have just now, a year on, discovered that what I made is, by some people, called an infinity scarf, but if I had been searching for a tutorial to make this type of scarf then the word infinity would never have appeared in my search. Last, some photos and descriptions are better than others. I have seen a bazillion tutorials for bound buttonholes, but none of them really clicked with me until I read Laura Mae's at http://lilacsandlace.blogspot.co.uk/2012/08/bound-buttonholes-tutorial.html, and I had the same problem with bias binding corners - I probably read ten or more tutorials until one finally clicked with me and it suddenly all made sense (I couldn't work out how to go around a right-angled corner). Oops, I hope that didn't come off as ranty, and I really hope you can catch up on your sleep soon. Your Mum looks lovely in her new shirt and I think you have just avoided the bulleyes look . Two hours though is amazing - yesterday I took about 50 minutes to sew 12 buttons on my husbands shirt alone. That's a lovely blouse you made for your Mum. It is funny how some techniques become so hot in blogging that they hit a point of over-saturation. Infinity scarves are one...I prefer it when people simply link to an already great tutorial rather than reinvent the wheel unless they really have something groundbreaking or unusual in their approach to add. 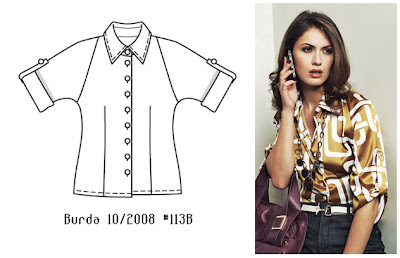 Oooh, I love it when people sew older Burda stuff, because there are so many great patterns. 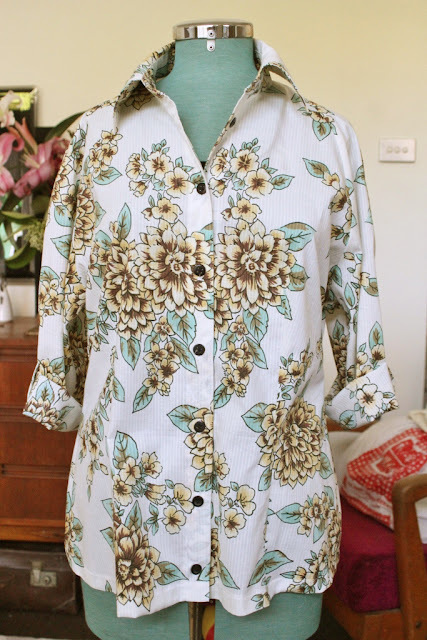 This blouse is equally lovely in cotton as it is in silk. Glad it fit! Oooh, we have the same pet peeve for craft blogs! Amateurs who think they are good enough to give tutorials send me straight to crankyville! Love the blouse, another great pattern I'd overlooked. The blouse for your Mum is amazing! Thanks for sharing a pic of h wearing it! I had to come back to find your rant on tutorials after you invoked mention of it in a newer post. I'd originally had my hands full of baby and just looked at the pretty pictures. That'll teach me to not read the content! I do agree on the subject of tutorials. When I do blog about a process, I usually just point the link at the tutorial I used, if any. Lovely blouse for your Mum and it will work with so many other colours.